Neighbors in Buffalo came together to make an incredible rescue this week. The story begins in Ashtabula, Ohio. 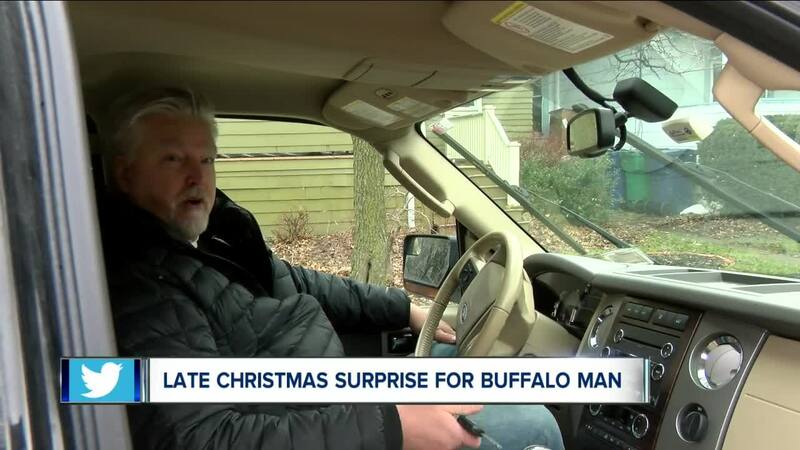 Where John Glover, of Buffalo, was driving home Christmas Day. He says something flew into his truck and when he went to check it out…saw feathers on his bumper and assumed whatever bird it was that hit him was dead. He then made the 2 hour drive home to Buffalo. 5 days later…he realized a HAWK was stuck in the grill of his car..and it was alive. His neighbor Deborah Lynn Williams quickly took action calling Messinger Woods Wildlife Care and Education Center to come help with the rescue. Erik Vogel took the car apart for John and Marianne Hites, a volunteer with Messigner Woods, pulled the Red-tailed hawk out and took it to her home to help nurse it back to health. But, the hawk has a long journey ahead. It has a very swollen broken wing and went almost a week without food or nutrients. Hites says that it is not even well enough to be given an x-ray yet. The hawk has to be stabilized before being fully evaluated but a vet to determine whether it can become well enough to release after being healed up…or, whether it needs to be put down. BUT, the volunteers tell 7 Eyewitness News that a lot of variables come into play when deciding the bird's fate. 3. If it's not returnable, and no volunteers have room for it...other centers will be contacted to see whether they'd like to keep the hawk. Messinger Woods is a volunteer based organization that says it is the only wildlife hospital in Western New York. The organization is only able to do work in the community through donations, and has a gofundme page set up to raise funds. If you can support their work, find a link here . Email Madison at madison.carter@wkbw.com , and keep up with her latest posts and stories on Facebook , Instagram , and Twitter .